When washing your hair, follow the steps and use the Pre-wash Conditioner first, and follow with the Shampoo last. 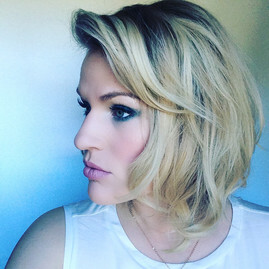 This leaves hair lighter and easier to style. Once hair is dry, finish by using the Hair Maximizer: Flexi-Max + Polishing Complex for bouncy, touchable hair. 1) My hair dries SUPER fast whenever I use these two products. I'm sure it is because having the shampoo second, the hair is less likely to be weighed down by any leftover conditioner, etc. 2) My hair is silky smooth, especially after using the Hair Maximizer. 3) Held styling really well. Backcombing went in and stayed amazingly, as did curling. 1) I try my best to use more natural products, so using shampoo and conditioner with mainly ingredients I can hardly pronounce sometimes makes me cringe (however, the overall length of the ingredients list is a lot shorter on these products than I have noticed on others). 2) If I let my hair dry naturally with these and just leave it, it does get a tiny bit frizzier than normal, but is quickly managed by the Hair Maximizer cream. 3) It has the classic TRESemmé scent to it, which can be a pro or a con...depending on your opinion. For me, I kind of like it...but feel it may be a bit much for some. 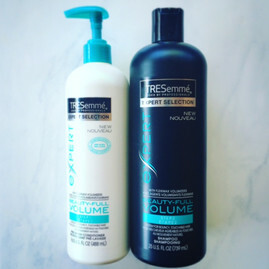 Yes, I completely agree that this Volume system from TRESemmé gives hair a ton of volume and in my opinion helps a lot in the pre-styling process. A great way to prep your hair. My hair felt lighter and thicker!